Diggers Valley: 13 August 2011. The week beginning the 13th of August 2011. The photographs in these pages should appear crisply clear. If they do not, you may be experiencing the same issue I am with my browser. If you force the page to refresh (holding down the Ctrl key while pressing F5, works in many browsers) the photos should appear as they were meant to. Later ... After some investigation I discovered that my internet service provider was compressing the data I received for picture files, reducing their quality. They told me most people didn't notice. I have no idea why they did it, since I was paying for the data anyway. This morning I moved the cows from the Back Barn paddock along the lane to the PW. It was a warm sunny spot out of the wind and the cows were in the sleepy mood which makes them quite hard to get moving when they stop. I had to walk through them and make a few go through the gate, then push another little group forward, or they'd have carried on standing in the lane. There's not a huge amount of obvious fresh feed in the paddock, so I suppose they couldn't muster much enthusiasm. 517, the first cow mated last summer, is looking very heavy in the belly! I'll have to recheck my calving date spreadsheet and ensure I draft the early cows off in good time for calving on the flats. Once they were all through the gate I went along to the end of Route 356 (the track to the right in the picture, named after our stuck steer), and refreshed the water in the trough on the far fenceline and added some iodine. New Zealand soils are deficient in Iodine and for decades our table salt has been iodised to address the problem in the human population. But we don't routinely do anything for the animals, other than via the salt licks occasionally provided - but from my recollection of iodine solutions always being stored in dark containers to protect them from light, I'm not sure how effective that provision is when the blocks are constantly out in the sunshine. 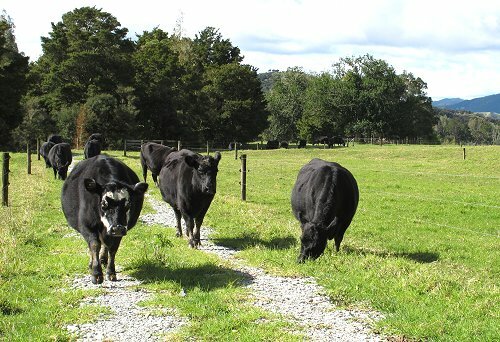 Several years ago a fertilizer sales representative mentioned another Northland cattle breeder's trouble with weak newborn calves, where iodine deficiency had been determined as the cause of the problem. 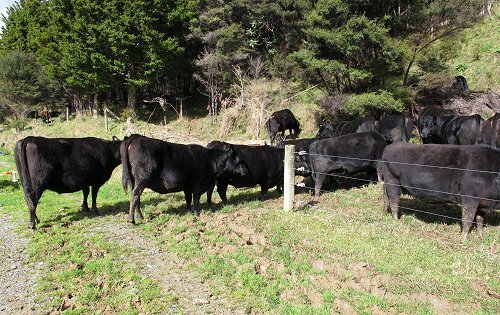 It seemed to me that it would be sensible to take heed, and since then I've been adding a bit of iodine to the water of my cattle, particularly in the weeks coming up to calving. 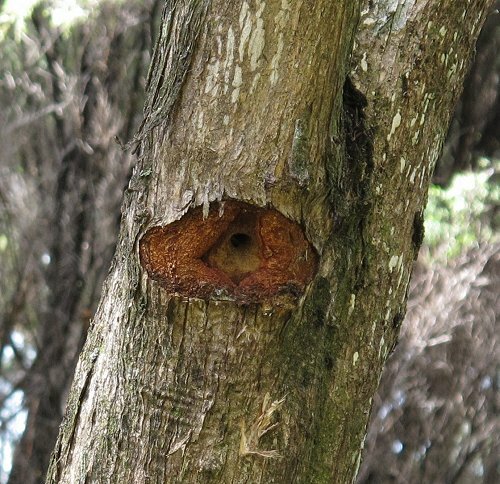 This is the trunk of a Kanuka tree (Kunzea ericoides) and the hole looks very like those made by the Puriri Moth caterpillar (Aenetus virescens). I have found many covered holes in Kanuka trees, and have assumed it is that caterpillar which lives inside. I'll have to do some deeper research to confirm. I found a couple of very good information pages I've not seen before when I did a search for Kanuka AND Puriri moths by their Latin names. 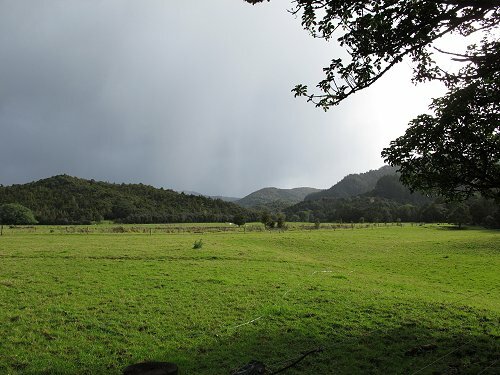 There is a Landcare Research Factsheet and a pdf document on recordings of emerging moths from The Entomological Society of New Zealand. Walking along the track I startled a male Tomtit (Petroica macrocephala toitoi), and when he'd flown off a little way, I spotted his partner. 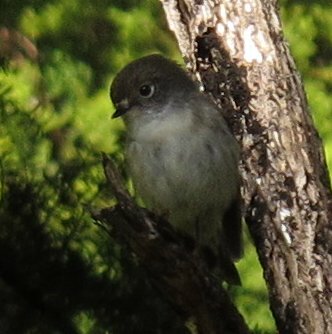 It is very common to hear and see the male birds in this area, but the females are seen far less frequently. I followed her for a little while through the trees as she hunted insects on their trunks. Today's news brought the announcement of the death of Sir Paul Reeves, who was Bishop of the Anglican Diocese of Auckland when I was 15. He later became Governor General of Aotearoa New Zealand, and has been active in many areas to do with equity and democracy and always spoke with great compassion for all, yet such vehement strength when required. His death will leave a large gap in the world. One could believe that because people like Paul Reeves existed, there was real hope for all humanity. Today was extremely cold, with reports of snow flurries in Auckland and even some as far north as Dargaville! This is very unusual. Hearing news reports of snow, I took this photo during the afternoon, wondering if that's what snow clouds look like? The sky was quite strange, but if there was snow up there somewhere, it was still too warm (relatively speaking) down here for any to reach us. Just before 6pm the outside temperature was 5°C. I'm always thankful for so much great firewood and a well-insulated house! The evenings are noticeably longer now, a fairly fast change in the daily pattern. In June it was dark just before 6pm; now it's still possible to do things outside until about 6.20pm. An extra half hour at the end of each day makes a significant difference. Soon we'll have an extra two and a half hours. I heard this morning that last year's last calf, heifer 667, died on Saturday after ingesting an orange, which stuck in her windpipe. What a sad end. The heifers had been grazing an old orchard, where the orange was probably on the ground. Cattle are at risk of this happening for some reason - they don't always chew or crush round fruit - so it is advisable to cut up any such foods before they're fed to them. I used to watch Ivy eating lemons whole (directly from the tree when she got the chance), and she always scrunched them up before swallowing them, so I didn't worry about her, but I did occasionally feed round fruit to the others and then wondered if I ought to have cut them up. My greenhouse is full of colour. The little white cyclamens are all grown from seeds I collected from the plant Sarah gave me after her wedding in 2006, where the little plants were in the centre of every table. 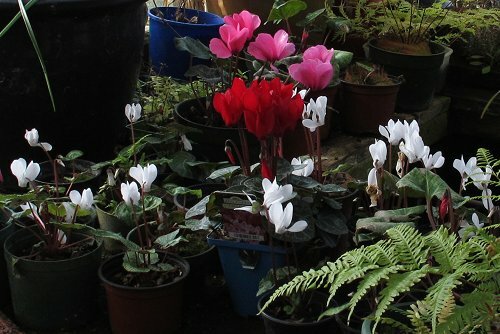 I wasn't sure of the genetics of Cyclamen colour, but it would appear that white begets white! In town the other day, I bought the dark red plant, wondering what will happen if I cross it with some of the white plants. The pink flowers are all ordinary sized flowers from plants I grew from seed from another pink flowering plant. There are two or three shades of pink; perhaps the next generation will be more varied. This feed isn't quite the quality I'd like to be able to offer my heifers, but they're all wandering around eating it in the hill paddock over the road. My mother, with my niece, Stella, has been gallivanting around the world - mostly in England with her sister and Joy's sons and family - and they arrived home this morning. My sense of relief was huge; I could feel it physically! Stella's only nine and Jill's become rather forgetful of late. It's that time of year when the cows get moved as much for a change of scenery as anything else. It has been a very kind winter overall - apart from this unusually cold snap - but this is always the hardest time of the year. The grass in the photos looks very green, but there's not a lot of it. I sat and listened to the radio for some time over the middle of the day, to the state funeral for Sir Paul Reeves. Later in the day I saw some of the television coverage of it and while some of the outside pictures were very moving - watching and listening to the Haka as the procession emerged from the Cathedral was spine-tingling, as always - I was glad I'd listened to the service and the eulogies without the distraction of the televised images. There's rarely enough sunshine in springtime to enjoy the effects of the sun's low angle in the sky. I usually only see these colours during autumn afternoons. 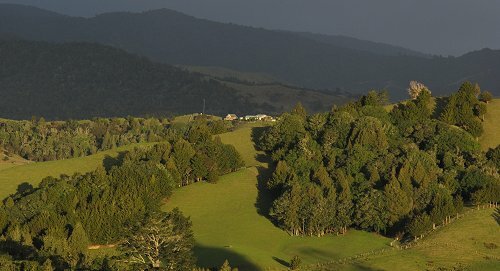 This is a view from one of the hills over the road, looking west toward the southern part of the Maungataniwha Range. Such a huge variation in Green! 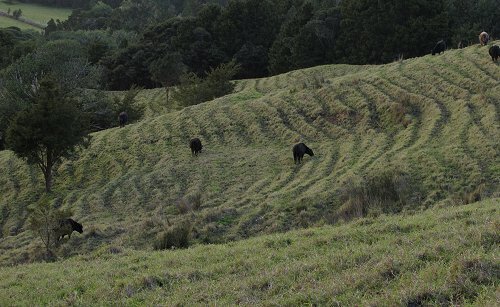 A little later, around on the south-east side of the hill, I noticed evidence of some land movement: the two cows in the centre of the picture are standing in the middle of a slow land-slide. I'm not sure what to do about this. It's probably not going to go far, since the cause is presumably a gradual undermining some distance underground as water moves toward the gully down to the left in the picture. 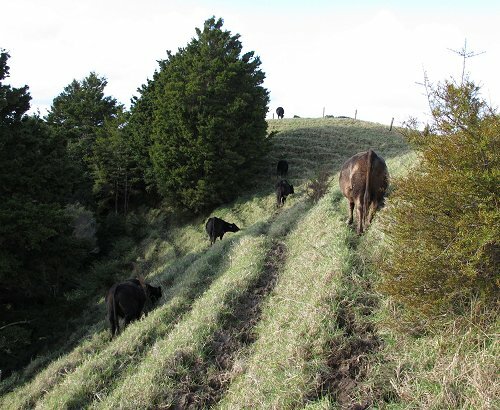 There's a similar slip on another face, which is a lot steeper, and which we intend fencing off from the cattle and planting, hoping to prevent its slide into a gully beneath.